How is a woman supposed to catch a husband? 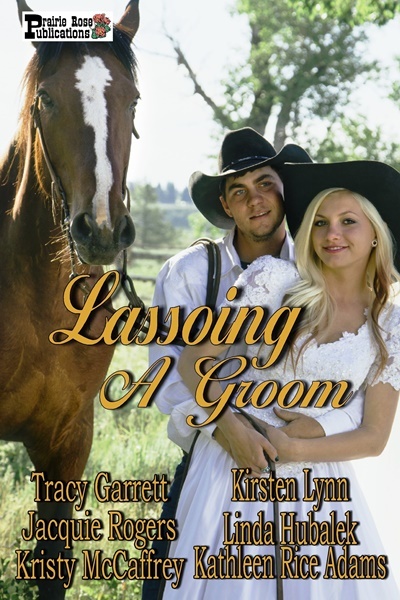 In the wild, wild west, she’s got to find a way to Lasso a Groom! Some of them are lawmen…some are outlaws. Ranchers and homesteaders are fair game, as well—none of 'em safe from love’s lariat, or the women who finally manage to rope ’em in! Can rancher Dex Madsen get past loner Betsy Lynch's goats and killer chicken to help save her mining claim and win her heart? He’s in town to tame a man-killer. She’s accused of being one. When she proposes marriage the race is on. He’s a confirmed bachelor…but she’ll capture his heart. In search of her brother, Annabel Cross enters Grand Canyon. When U.S. Deputy Marshal Angus Docherty rescues her from a cliff side, her most guarded secret might save them. Will a dangerous man from Gussie Hamner’s past sabotage the future she’s building with Noah Wilerson? An inept bank robber and a bossy spinster team up to rob an empty vault. What could go wrong?